Ex-Eurythmic Dave Stewart has told SuperDeluxeEdition via twitter that we should forget about a 25th anniversary reissue of the Eurythmics‘ tour de force Savage. The album was released in November 1987 and was on our ‘wishlist‘ for 2012 reissues last December. 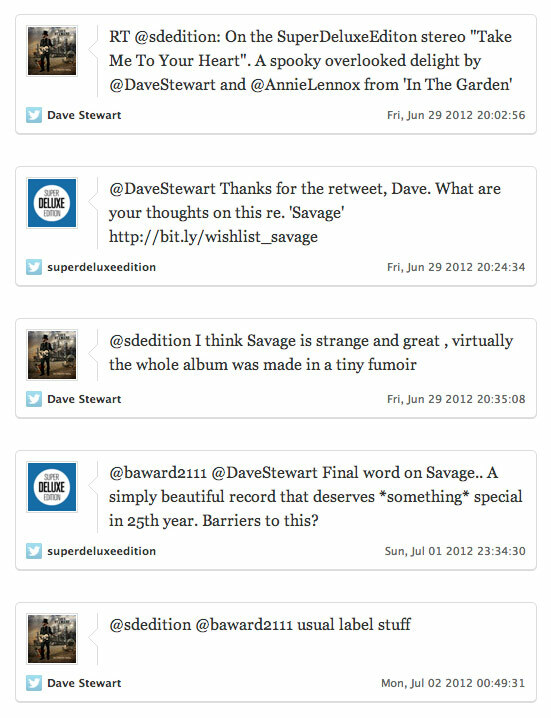 As can be seen from the twitter exchange below, Stewart describes the album as “strange and great” but when asked what the barriers are to getting an anniversary reissue released later this year, he responds with “usual label stuff”. By this, it is safe to assume that the Eurythmics back catalogue is stuck in a place where the people in control either have no interest in it, or at least can’t see a way to make money out of it – or both. (RCA records, the original label, are currently part of the Sony group). Although all the albums were re-released and repackaged in modest single CD editions back in 2005, since that time the band’s first seven albums have all had 25th birthdays with no special editions to celebrate the occasion for any of them. We are talking about a mixture of massively influential (and successful) early albums such as Sweet Dreams (Are Made Of This) and Touch, as well as big selling commercial records like Be Yourself Tonight and Revenge. Savage was not a significant commercial success, particularly in the US, but was well received critically. Dave Stewart and Annie Lennox were proud enough of the work to commission a video for all twelve tracks on the album. This has never been reissued on DVD and is stuck in VHS hell. Ironically, Dave Stewart’s ex-wife Siobhan Fahey sees a relatively lavish reissue later this year for Hormonally Yours, the 1992 release from Shakespears Sister, the band fronted by herself and Marcella Detroit. That album is being released as a 2CD+DVD deluxe edition, exactly the format that would work for Savage. Dave Stewart will be taking his ‘Ringmaster Tour’ to the UK in September. Tickets are on-sale here. I was disappointed by the remastering on those reissues. The Eurythmics 2005 remasters had a lot of love put into them by Dave in particular and the team at BMG did the best job they could with the limited resources they had at the time. Same situation with the 2004/06 Japan releases that involved the same few people. I think they did a good job and Dave & Annie should be commended for effectively giving fans a full cover versions album spread across all the discs as bonus tracks. In retrospect I’d have preferred those presented on 1 Cd as a bonus for buying “Eurythmics Boxed” and had the 12″ mixes and b-sides as bonus tracks (most are present and correct but not all). But yes I agree if there’s one album that deserves the deluxe treatment it’s “Savage”. I guess that the record company thinks that the 2005 remaster already covers suffices as a ‘deluxe’ edition of the album, although there are several mixes from the era that weren’t included on that version – and of course there’s the seminal video album that still hasn’t seen the light of day beyond VHS. What an album though – an astounding and very brave sharp left turn after the somewhat conventional Revenge. As a fan favourite, perhaps one day we might see a more substantial Savage, but I’d imagine one of their better known albums like Sweet Dreams would be first in line if one were to be beefed up again – what’s more, there are an embarrassment of B sides from that era omitted from the 2005 remastered version that could make up a fully comprehensive anniversary edition. 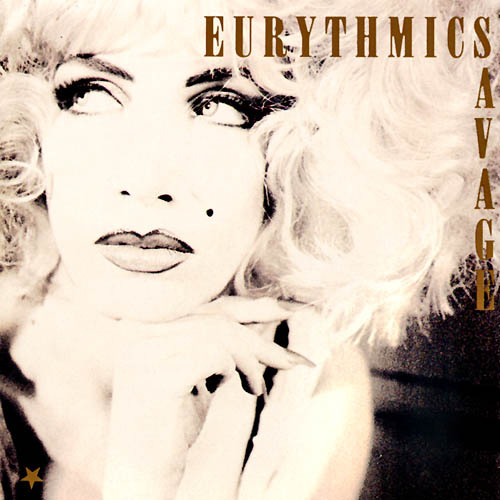 SAVAGE is indeed my favorite Eurythmics album. Brilliant from start to finish. Pretty much every Eurythmics fan I know seems to agree. I’d kill for a remastered deluxe edition that includes all remixes/b-sides and the video album. I’m not discounting the nicely packaged but rather slight 2005 reissues, but is it just me or do Eurythmics seem to have become the ‘forgotten’ band of the 1980s? They were massive after all. If Jason Donovan albums can get 2CD reissues with money to be made, what’s going on at Sony? Major label politics getting in the way of music I guess. Don’t even start me on The The !!! I follow his Twitter but it’s all politics and no talk of music! Bought the ‘Tony’ soundtrack when it came out. Nice little package. Totally agree re 1984 needing to be remastered – a brave and great soundtrack but too much politics by what i’ve read – but for me a remastered Touch Dance on CD would be top of my list…. Hey Tom, agree with you entirely. However I guess unless the artist is in control, the labels will always start with the big sellers, so Sweet Dreams or maybe Be Yourself Tonight would be better commercial prospects. The 1984 soundtrack desperately needs some kind of reissue too (having not been included in the 2005 releases). That’s a “Shame”. Of all the Eurythmics albums, I feel “Savage” deserves the extra deluxe treatment. It is a superb album, and the videos are amazing and iconic, particularly “Beethoven (I Love to Listen to)”. The 2005 remasters were good but could have been so much better.